Most people, particularly outside of Italy, are likely more familiar with the gnocchi that are small, tender (the store-bought, packaged type are often sticky and chewy, but that is not how handmade gnocchi are supposed to be) dumplings made with potatoes. But a different kind of gnocco exists in Italy, made in Rome, which is completely different: round, flat gnocchi about 3 inches in diameter, made with semolina flour instead. 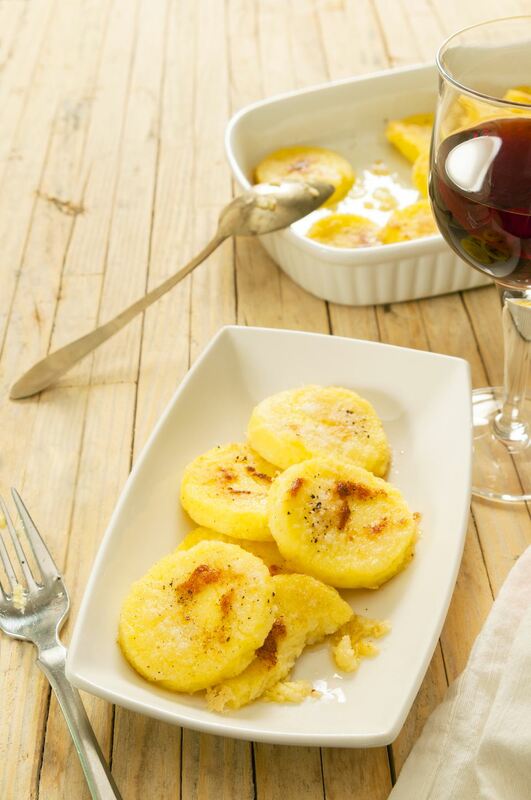 These tender dumplings, which are baked with abundant cheese and butter, are known as "gnocchi alla romana" (Roman-style gnocchi). Livio Jannattoni, one of the great Roman gastronomes, says he grew up eating potato gnocchi, and first encountered Gnocchi alla Romana in a dining car on a train far from the city. "Where were the potatoes I knew so well? Horrors! These gnocchi were made just with semolina..." He does give a recipe for them, however, which is unusual because not all Roman authors do. If you buy semolina flour for this recipe and are wondering what to do with this rest of it, you can use it to make fresh pasta, or Migliaccio, a lovely Neapolitan crustless cake made with fresh ricotta, semolina flour, lemons, and limoncello. Bring the milk to a boil, and gradually stir in the semolina, constantly stirring to prevent lumps and keep the mixture from sticking to the pot. The mixture will become quite thick; continue cooking and stirring for about 20 minutes, and remove the pot from the fire. Beat the yolks with a little more milk, and add them to the semolina, together with the cheese, solid butter, and a pinch of salt. Mix well and spread the mixture a little less than a half an inch thick (1 cm) on your work surface. Let the semolina cool for 2 hours, and cut it into squares or diamonds. Butter a pan and layer the squares in it, spreading a little more grated cheese between the layers (there should be 3-4). When all is used up, sprinkle the melted butter over the gnocchi, slowly, to allow it to penetrate. Bake the gnocchi for 15 minutes in a hot (400 F or 200 C) oven, until golden, and serve at once.